Size/shape: 11mm (long) x 9mm (wide) x 6mm (thick) chubby ovals. 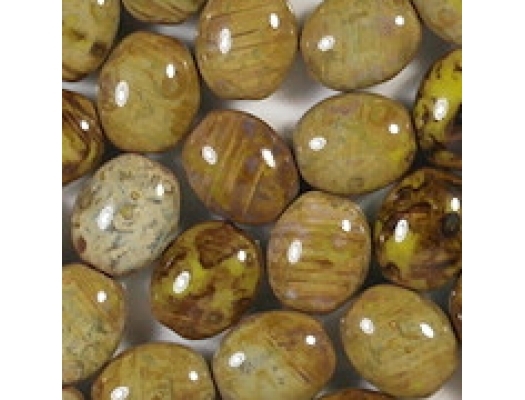 Colors/description: Opaque chartreuse green (almost yellow) with a multicolored picasso coating (tan, brown, dark brown, and hints of blue and green). The overall effect is a mustard yellow. 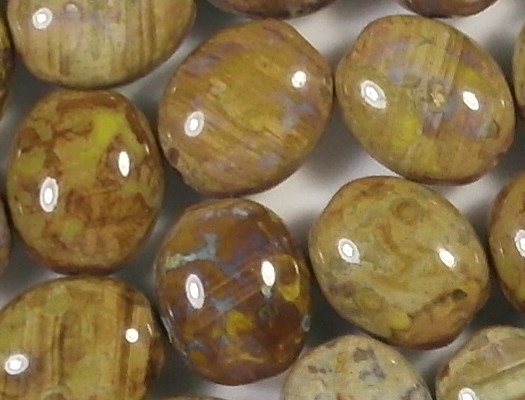 Defects: Some of the beads have cracks and fissures (and a very small number have small pits along the fissures), but the picasso coating is so heavy and varied in its appearance that the defects are hard to see. There is no evidence that any of the beads are coming apart, so I decided not to return the beads (also, this particular supplier doesn't like to get returns). However, I am giving them a lower markup than I otherwise would (for a savings of about 65 cents per lot). Even with the low markup, they are quite expensive, since the supplier charges a lot for them. I should also say that I'm not inspecting the beads individually. 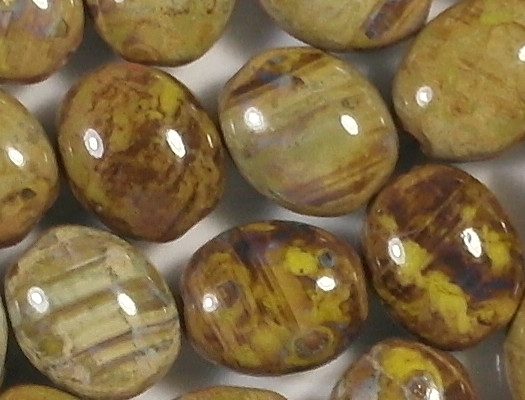 To find beads with defects, I would have to use a magnifying glass, and I can't go to that much trouble. If you receive even one bead that is too defective to use, please be sure to contact me for a pro-rated refund. Comments: Years ago I carried similar beads under the G1689 number, but these are quite a bit different, so I am giving them a new number. My photography equipment puts two distracting light spots on each bead, but there is nothing I can do about that. I no longer use light from the window to take photographs. 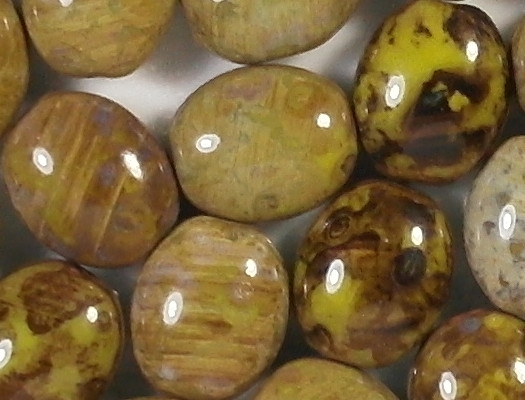 I was saddened when I examined the beads and discovered that some had fissures and cracks (see Defects above). 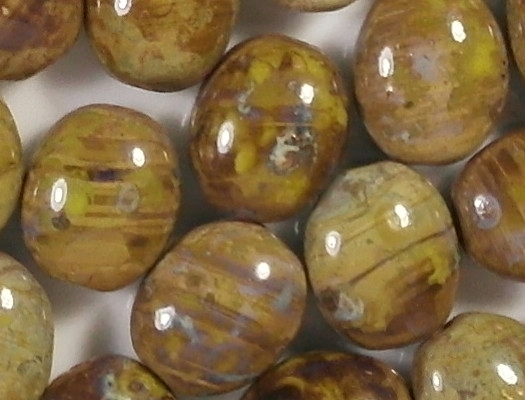 I want everything I sell to be perfect, but that's impossible given that I buy my beads on the internet. Even if I had seen them in person, however, I might not have seen the cracks -- that's because the cracks are very well concealed. 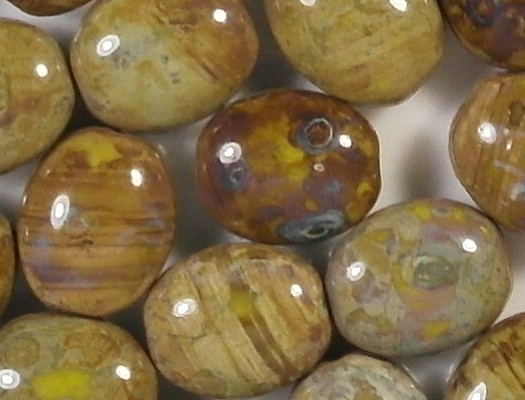 Beads are never annealed (cooled slowly to prevent cracks), so cracks sometimes occur, especially in opaque beads. 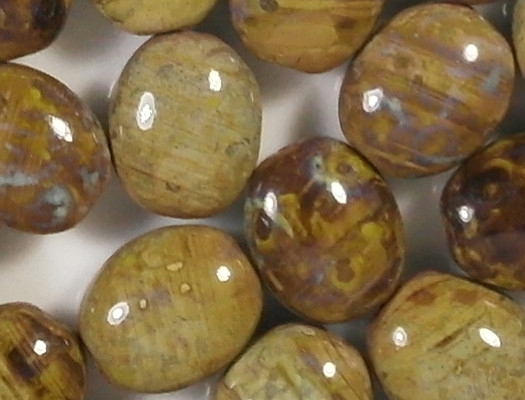 It is a fairly common practice for Czech manufacturers to cover cracked beads with a coating. In this case they were very successful since it takes a magnifying glass to see the defects. 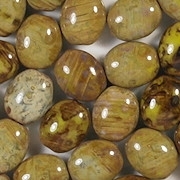 As I said above, I am giving you a price break on the beads, although they are still expensive. 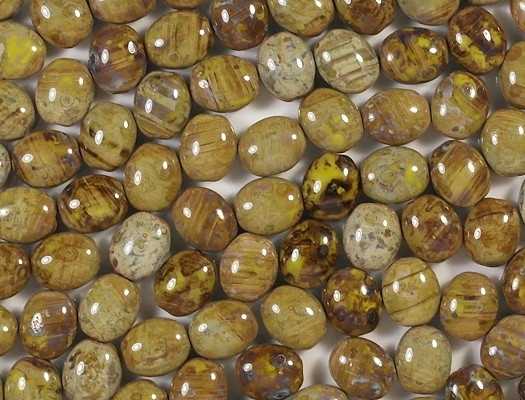 The beads are gorgeous, and I think they are worth the price. If any of the beads you receive are too defective to use, just contact me for a pro-rated refund.